As a side-scrolling shooter spin-off, the gameplay of Gun Hazard differs from the tactical role-playing game entries of the numbered Front Mission titles. Rather than being played out on a grid-based map and using a turn-based structure, battles takes place in real-time on scrolling 2D maps akin to Assault Suits Valken (titled Cybernator outside of Japan), a game which shared several key development staff with Gun Hazard. The player controls one character who pilots a mech known as the wanderpanzer, or wanzer. A second, AI-controlled ally unit can be chosen to provide support to the player during missions. The player can control their ally’s actions, such as ordering them to retreat or use their special weapons. This ally unit can also be controlled by a second player through the use of a secret in-game cheat. Game progression in Gun Hazard is done in linear manner: watch cut-scene events, complete missions, set up wanzers and vehicles during intermissions, and sortie for the next mission. The player travels to locations on a point-and-click world map. Upon choosing a location on the world map, a map of the location is brought up. In these locations, the player can travel to various areas to complete missions and progress the plot. Upon completing all mandatory story-related missions, new locations are revealed on the world map. Unlike other Front Mission titles, the player can revisit these locations and redo its missions at any given time. 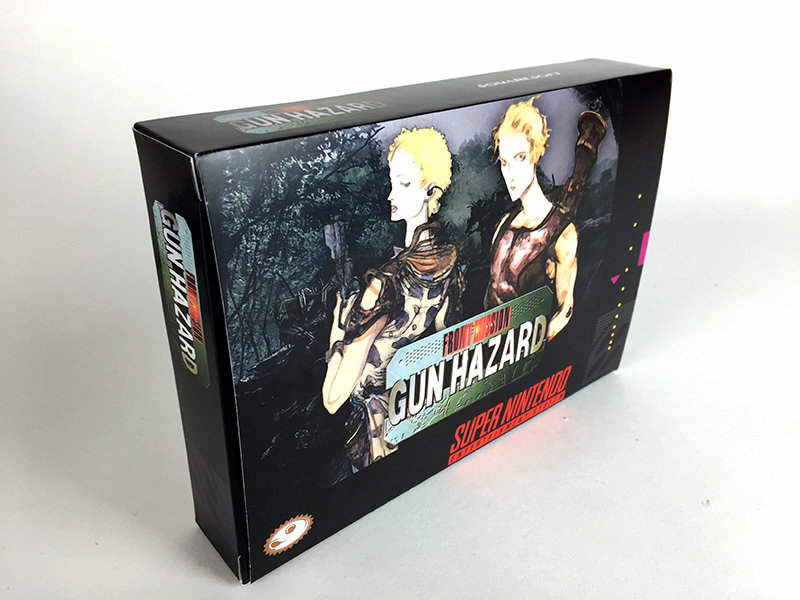 In Gun Hazard, the player has two ways to play the game: inside the wanzer or on foot as the pilot. Wanzers can do the following actions in mission play: walk, jump, fly, dash, use shields, and use weapons. A wanzer uses one of four, unique primary weapons for combat – vulcan guns, shotguns, laser rifles, and napalm guns. They can be also outfitted with secondary, special weapons that have their own unique properties and uses. On foot, the pilot can do the following actions: walk, jump, dash, crouch, climb, use jet pack (to fly) and use weapons. The pilot only has two means of attacking – handguns and hand grenades. While playing as a pilot is not required to beat the game, there are missions that can only be cleared by getting out of the wanzer. Upon completing missions, players receive monetary rewards that can be used to purchase new parts and weapons to be used in combat. A unique feature of Gun Hazard is its usage-based progression system. The usefulness of parts and weapons increases with prolonged usage; the more they are used in missions, the more effective they become. For example, constant usage of a vulcan gun results in increased damage output and reduced reload times. Using a vernier unit to fly can boost its flight duration time and increase the maximum altitude it can reach. Similarly, absorbing damage while inside a wanzer increases its ability to defend against enemy attacks. This progression system also affects the effectiveness of the pilot’s weapons as well; for example, the pilot can throw up to two hand grenades at once if they have used it enough times. Missions aside, Gun Hazard boasts other new features seen in future Front Mission entries: a job system and remodeling. The job system creates clearly defined roles for the characters that the player can use in missions, particularly the ones that can be taken in missions as a second ally unit. Brenda Lockheart provides aerial bombardment as a sniper-type unit, whereas Emil Szynsky’s repairman wanzer acts as a mechanic-type unit. Each character has a specific purpose on the battlefield, and the game encourages the player to make the most out of them to complete missions. Remodeling is a feature that allows the player to upgrade their parts. For example, a shotgun can be outfitted with a larger barrel to fire more rounds or a bigger storage clip to hold more ammunition. Star Fox 2 Back in Stock! The Frenzy Sale is over but not Forgotten!